The metal Impella gift set features a ball point pen and a mechanical pencil. Both instruments feature matching smooth designs and striking gold accents. 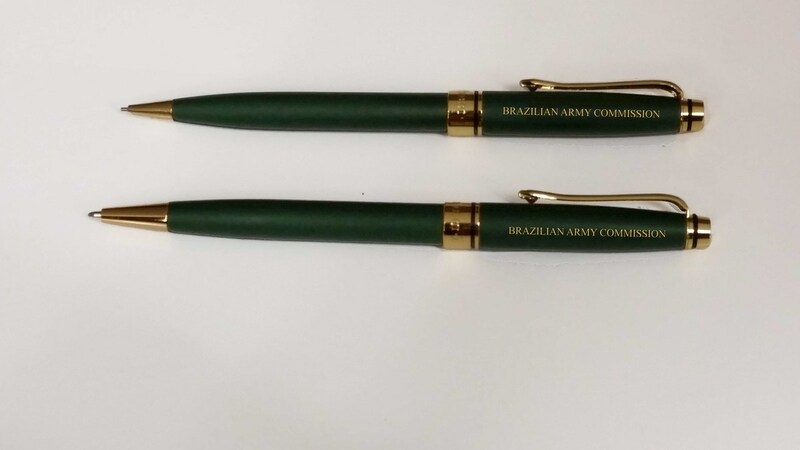 Customize this handsome writing set with your company name and logo to create a strong product recipients will want to use again and again. Standard packaging is a velveteen pouch. Pens and packaging sold separately. Logo set-up: $50.00(G) Straight line text set-up: $25.00(G) Personalization is available and free. One Setup per PO. 1st area of engraving is included with no run charge. 2nd Area of engraving is $1.00(G). Blue ink is $0.31(G). Blank items receive (EQP) End Quantity Pricing. First column pricing plus 20% charge for less than minimum quantity ordered. Rush service available up to a 1-day production time.